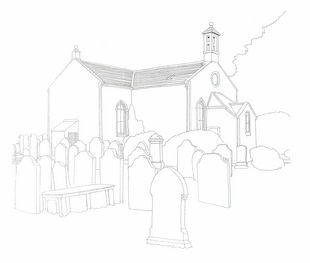 Traditional T-plan kirk of 1793 with round-headed windows and birdcage bellcote. Interior refurbished 1884 by James Barbour. Stained glass windows of ‘Christ the Good Shepherd’ and ‘The Agony in the Garden’ by Ballantine and Gardiner, 1893. Three richly carved ancient Hog Stones, probably 13th century, with Viking/Dane connection. There is no bell; it lies at the door of the sanctuary in Bowness-on-Solway on the English side, taken in reprisal for the theft by the Scots of the Bowness bell and its loss in the Solway.